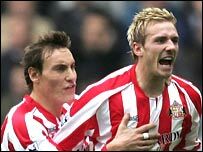 Dean Whitehead and Liam Lawrence have signed new contracts at Sunderland. Midfielder Whitehead, 24, has pledged himself to the club until 2011, while winger Lawrence, also 24, has sealed a four-year extension to his deal. Boss Niall Quinn described the pair as "exceptional" and conceded: "Their heads could easily have been turned. "They were key players last year and they want to lead the charge in bringing us back to where we want to be as a club." The news comes as a fillip to Sunderland, who have also won their four pre-season matches under Quinn - and without conceding a goal. The former Black Cats striker, who is also the new chairman on Wearside, knows the challenges ahead will prove more testing but is delighted by the efforts of his squad. "They have turned a corner in the last 10 days," said Quinn. "There is a crisp edge to training. They are enjoying coming in again after a pretty tough year last year. There will be some baggage there but I'm quietly confident." But, while describing his squad as a "solid set of guys", Quinn is looking to bring new faces to the club and has not ruled out making a move in the transfer market before the opening game of the season against Coventry on Sunday. "We have until 12 o'clock on Friday and we are anxious to get some things done," he added. "The transfer window is getting closer to closing all the time and we didn't have a good run at that. "Other clubs are content and happy with their squads but I'm not. We are about six weeks behind and that is the major stumbling block. "We have put bids together for four or five and two or three very strong enquiries. We will get them or we won't. I would be very happy with half-a-dozen at the end of August." Sunderland have been heavily linked with West Ham left-back Clive Clarke but Cologne's attacking midfielder Ricardo Cabanas looks set to move elsewhere and a bid for Aston Villa striker Kevin Phillips has not got off the ground. Quinn sees his former Sunderland strike partner Phillips as a perfect squad addition but concedes it will be difficult to bring him to the club, considering the situation at Villa Park. Villa, who are currently without a manager, are the subject of a number of takeover rumours. "I've been told there's nothing doing with Kevin at the moment and that's fine," Quinn said. "I understand Villa's position. "The fans would appreciate seeing him here and he would be of a benefit to the club. Others would come as a player but he would bring a lot more. "He would bring a professionalism to everything he does and I know players here would learn being around the consummate professional."